In a previous post I asked “why do we do this”. This has been on my mind a lot. 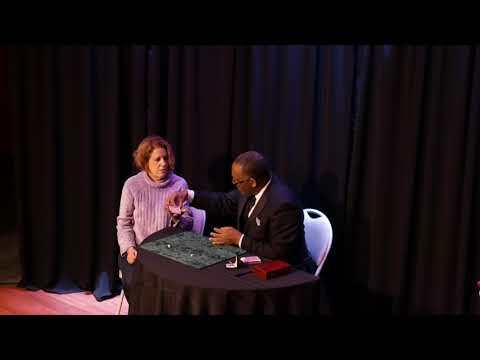 A recent performance I gave during my one man show provided all the answers I needed. Sit back and enjoy this video, we have a lot to discuss in this blog post. This post and performance is dedicated to my dear friend Jason Ladanye. He is the best card man I have seen in the last 15 years. While my opinion is subjective, my evaluation of Jason and his creative out put is based on spending time with him, enjoying his thought process, his technical ability, watching him perform to lay people and plus the fact I like him as a person. I mention Jason in the context of this blog post because the routine in this video is his glorious creation. It is called Lucky Charms. Now, back to the point of this post – audience reaction. This is the reason why we perform magic. There was a time when we all once gasped in total astonishment. I can remember vividly when Alan Alan stunned me with his Rising Card. I sat next to Slydini in awe. I was completely blown away by Tommy Wonder, Albert Goshman, Fred Kaps, Harry Lorayne, Cy Endfield. And I am talking blown away by the feeling of magic. It was uncanny, for a brief moment, I felt magic was real. This video performance reminded me why I do magic. It is my duty to give my audience the absolute best experience of magic I am capable of. Anything less and I consider myself a failure. In watching this video, it reminded me of the responsibility I have and the privilege of being a magician. To give this gift away is a wonderful thing. I must be honest and say when I was younger my ego was in overdrive – my performance was all about “ME”. Now, it’s about creating a synergistic partnership with my audience. I see my audience as my collaborators in my show. Together, WE create the experience and atmosphere of magic. It is imperative that we have at our disposal the strongest material possible. We must also present our magic with a stylish, authentic and dignified presentation. If you are serious about presenting strong magic then study the classic books, watch my DVDs, study the work of Darwin Ortiz and Jason Ladanye. Jason’s new book is called GAME CHANGER. Think about your magic for a moment, ask yourself honestly if your magic produces astonishment for your audience? Now astonishment is not the same as amusement or curiosity, no, it is that child like state of wonder, enchantment and the feeling that comes with it is magical. Astonishment is our natural state. Our job as magicians is to open that door within our audience. We are the key that unlocks that feeling and set it it free. Our audience will thank us in the only way they feel compelled to – a standing ovation.